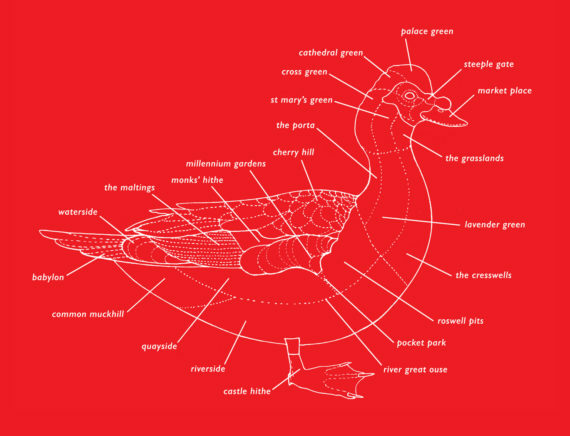 The Day of the Duck employs the twin forms of play script and ornithological instructional manual to dig away at the muddied idea of Englishness. This ‘Duck Noir’ story follows a Muscovy duck as it questions the residents of a rural Fenland city. Waddling past the Maltings on its journey from a footpath in the Fens up to the Market Square it applies a cool forensic analysis to behaviour in public space: how humans stand, how they converse, sit on a bench or wait for a bus. In looking for answers to why its brethren have abruptly disappeared, this duck-tective begins to understand how small daily acts offer both opportunities and challenges to new arrivals, to those perceived as different or un-deserving or un-English. As the background Brexit whine twists up a notch, the duck sets out to confront the city with the awful truth it has uncovered. The Day of the Duck shows that, whether you voted LEAVE or REMAIN, whether you are a duck lover or a hater, your daily actions may be the bedrock for a very English bigotry. The Day of the Duck evolved out of A Day with a Duck, artist’s residency and gallery presentation at Babylon Gallery in 2012, exploring alternate/unplanned places, focusing on city territories and contrasts between the urban and the wild. Limited edition Artists’ Book of 500 copies. ISBN: 978-0-9933373-3-8. Retail price: £15.99. Distribution: Central Books, London.